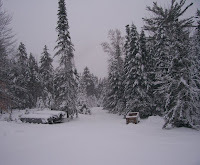 October Nor'easter Dumps a Foot of Snow in the Adirondacks!!! As you can see in today's view from home, we received a foot of snow yesterday afternoon and overnight from the October 2008 Nor'easter. It is still snowing out and I'll have more later today about the skiing. Since this is a blog about what it is like to live in the Great White North of the Adirondacks, I'll tell you part of this lifestyle is getting out of the driveway after a big snow when the snowplow guy hasn't plowed yet! Umm, or, not getting out.